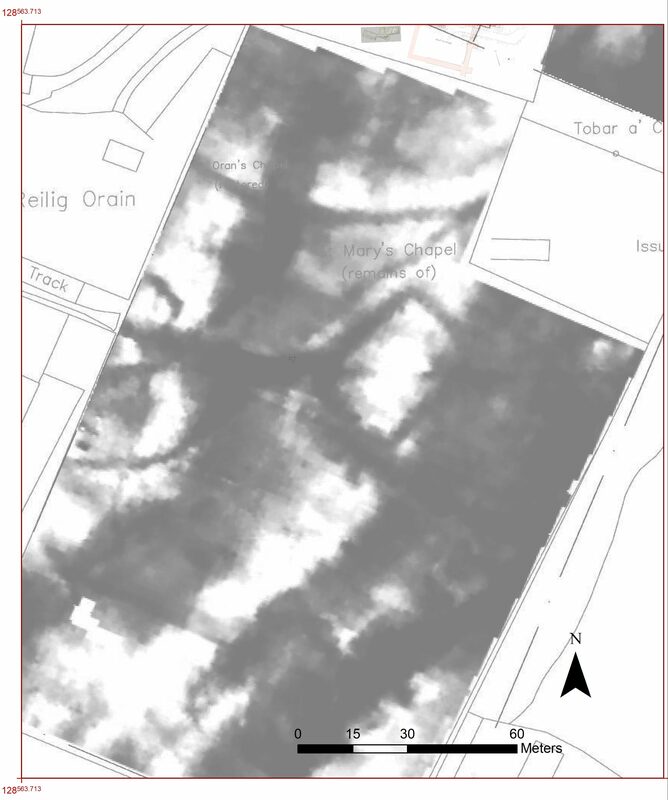 We are happy to announce that our data structure report, our interim statement of what we did and what we found during our 2018 excavation, is now available to download here. Thanks again to Historic Environment Scotland and the University of Glasgow for funding the excavations, and Richard Strachan, John Raven and Simon Stronach of HES for support through the project. Our partners in the National Trust for Scotland and in particular Derek Alexander have been crucial to our understanding of the wider island context. 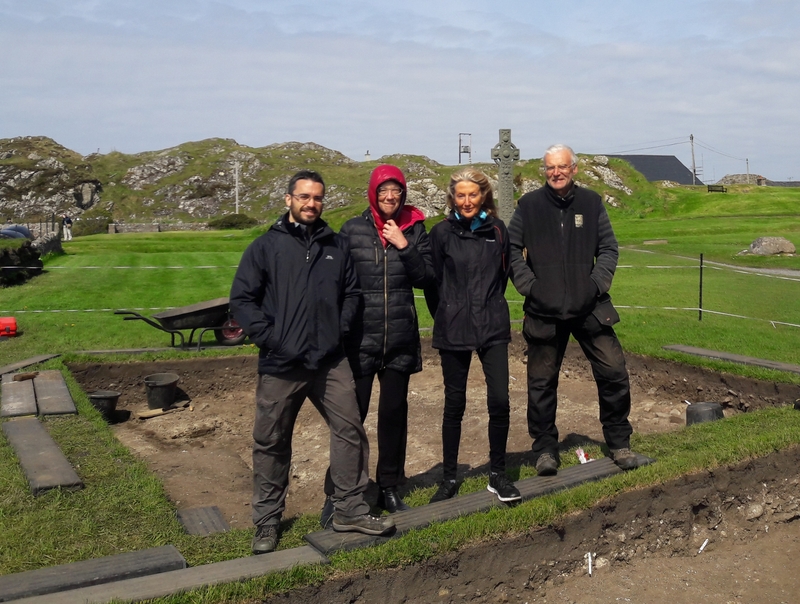 Thanks also to Emma Wilkins (NTS ranger), Jane Martin and Gordon Rutherford of the HES staff on Iona for much help on site. Thanks to Andrew Prentice, the tenant farmer, for helping with access to Site D and interest in the excavations. As well as the main site team thanks are due to Gert Petersen, for organising and delivering our equipment for the excavation. We had a particularly exciting find from the Abbey trench this week in the form of a silver coin from the reign of Alexander III of Scotland! Alexander ruled from 1249 to 1286, and also saw the return of the Hebrides to Scottish rule. 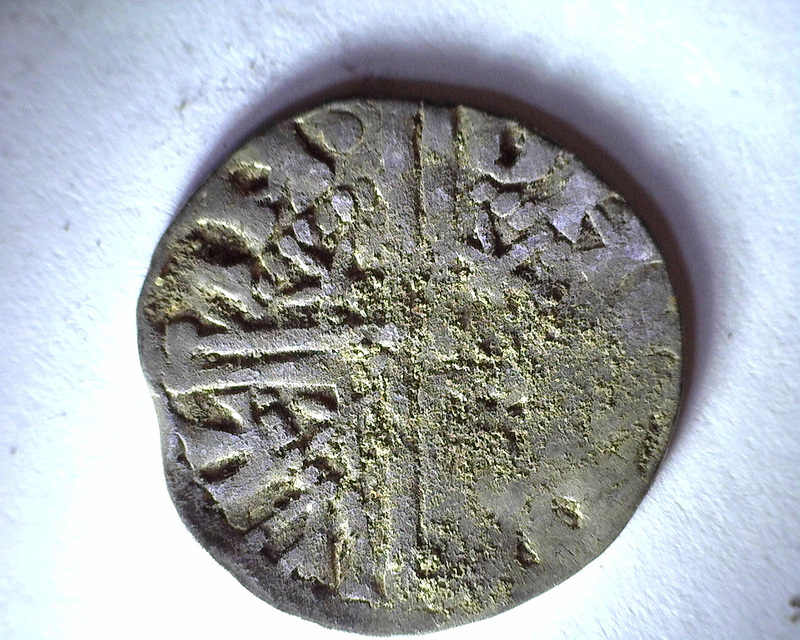 The coin also dates to just after the founding of the Benedictine Abbey, and is most likely connected to activities there. 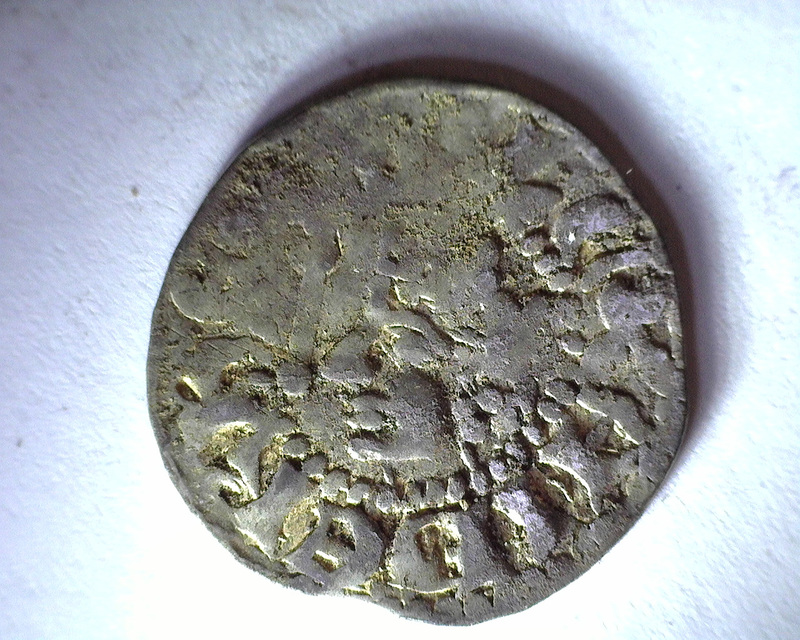 While this coin dates to the 13th century, it was in one of the debris layers from the modern stonemason’s yard. It may have been churned up in the activity and deposited with the debris, as were several bronze objects and medieval ceramics. It’s been particularly sunny and warm the last few days, with Iona finally starting to feel like summer! 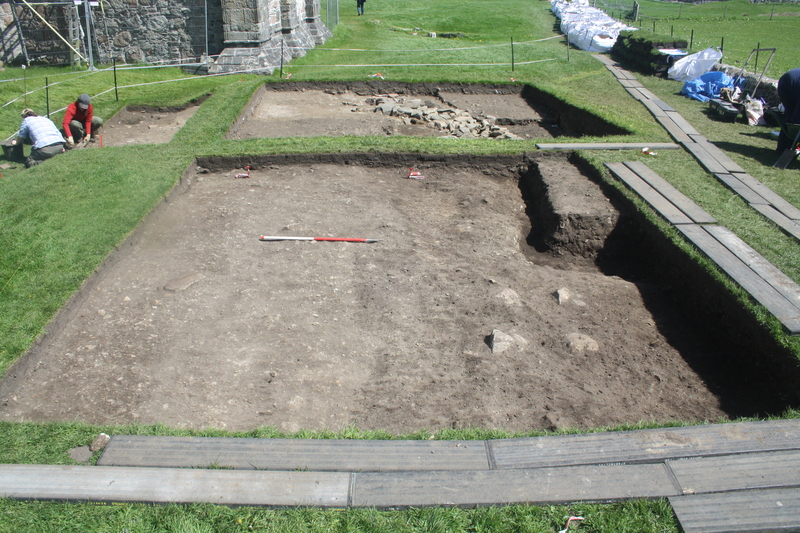 Our trench at the Abbey will be active for the weekend, after which we will begin covering it with geo-textile and filling it again with all the dirt we’ve dug out over the last three weeks. Tomorrow, for any who are interested and in the area, we are giving a talk at the Village Hall at 7:30pm, beginning with an update on the excavation followed by a discussion of the oldest portrait of St. Columba, found in a manuscript in Switzerland. 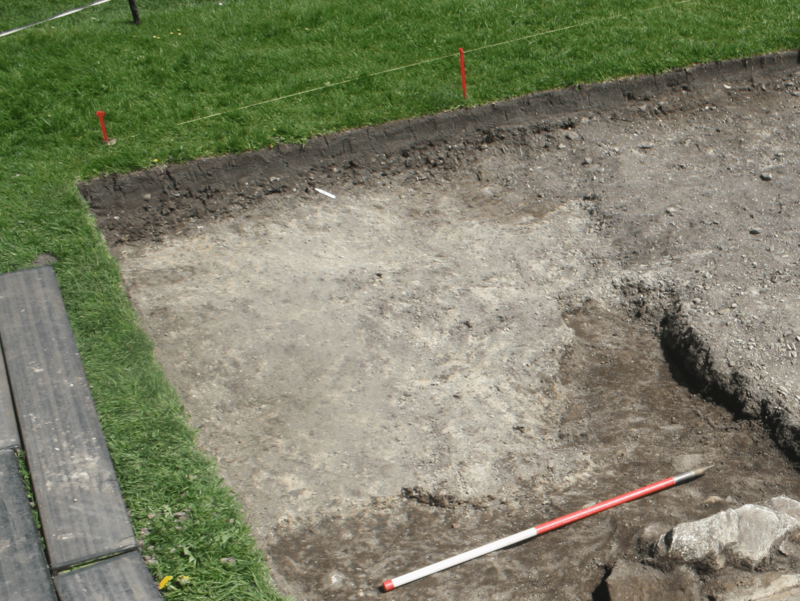 One of the main objectives of this year’s excavations is to understand how the older archaeological deposits have been affected by the complex series of landscaping and reconstructions events which have taken place around the Abbey over the last 150 years. In our last post, we mentioned that we had found evidence of the stonemason’s yard from the building works that took place between 1902 and 1910. The evidence is quite extensive, and covers a wide range of the manufacturing process for the stones now incorporated into the Abbey. The tough, yellow sandy layer we mentioned last week is the dust created from the stonemasons shaping the stone. 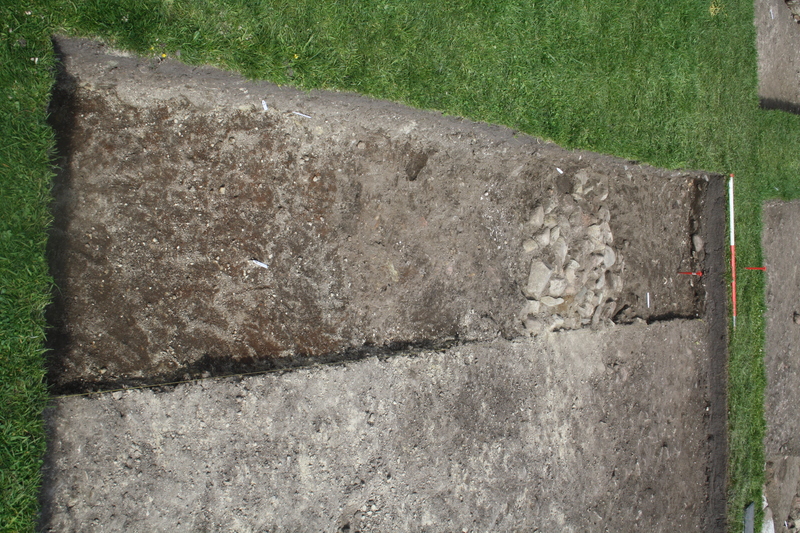 Its outline in our trench shows the walled area of the yard – the dust only travelling as far as the walls allowed it to go. Cobbled area indicating the location of the stonemason’s bench. Directly east of the yellow stone-dust layer is a layer of cobbles, which served as the surface upon which the masons placed their bench (or banker). Here, they would shape the stones by chipping off unwanted pieces, which we found in a tough, compacted layer to the south of this bench. 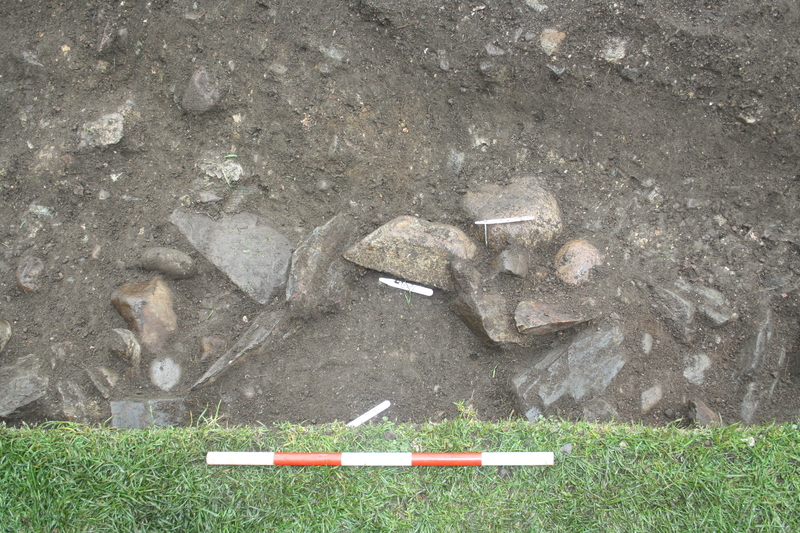 Within these layers of stone-working debris, we have also found a piece of window tracery (or mullion), a finished wall stone, and a chamfered block from an arch. From left to right: a pile of chipped stone, window tracery, shaped stone for a wall, and a chamfered stone from an arch. Directly to the east of this yard we have found a large spread of limpet and periwinkle shells, which were used to create mortar for the renovation works. There are also several spreads of mortar to the east of the mason’s yard. When the building works were completed, the debris was left largely in place. We believe the leftover shell was spread across the site to even out the ground layer. Otherwise, the majority of the debris has remained untouched for just over a century, allowing us to reconstruct the workstations of the stonemasons from 1902. We have met a large number of people over the last two weeks! 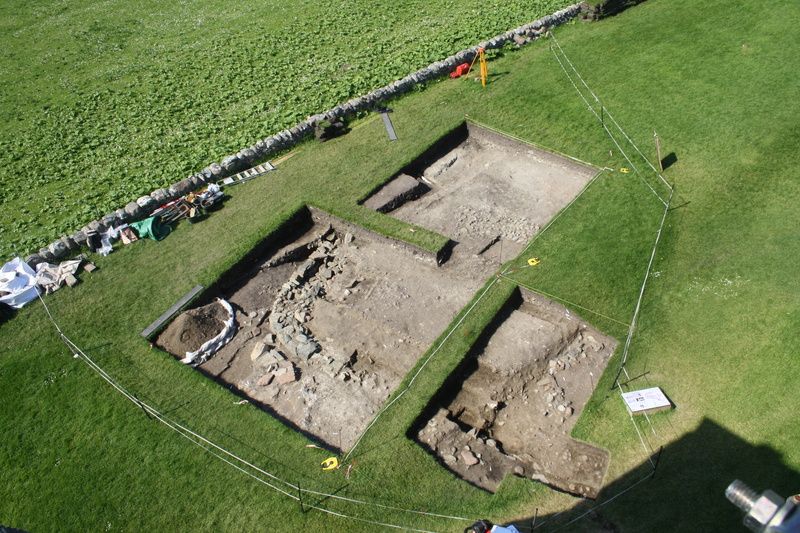 If you happen to be in the area, we are excavating until the end of this week. Feel free to stop by and say hello! Yesterday we mentioned the pit of large stones we found in the western extension. 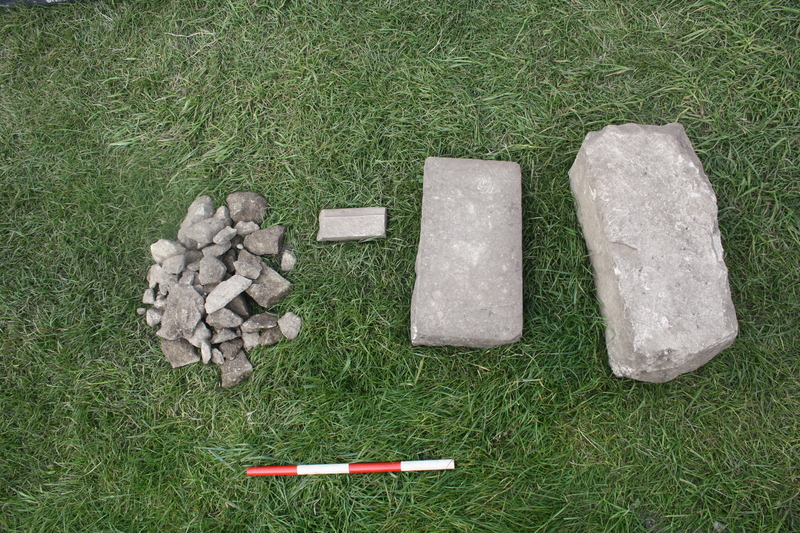 These stones are part of the building materials used to conserve and rebuild the abbey in the early 1900s, most of which was dumped and levelled in the area of our trench to create the small rise that is seen today. Photographs from 1870 show the abbey largely in ruins – similar to how the nunnery down the road looks today. The eastern side fared better than the west, which was largely marked by piles of collapsed wall. The bottom of St. Matthew’s cross still stood in its base, but the well and St. Columba’s shrine were piles of rubble. In 1878, some conservation and consolidation works were completed to preserve the footprint (or outline) of the monastery. We can see the well was built up again, as well as the eastern walls. The exposed edges of the standing walls were also conserved and reinforced. 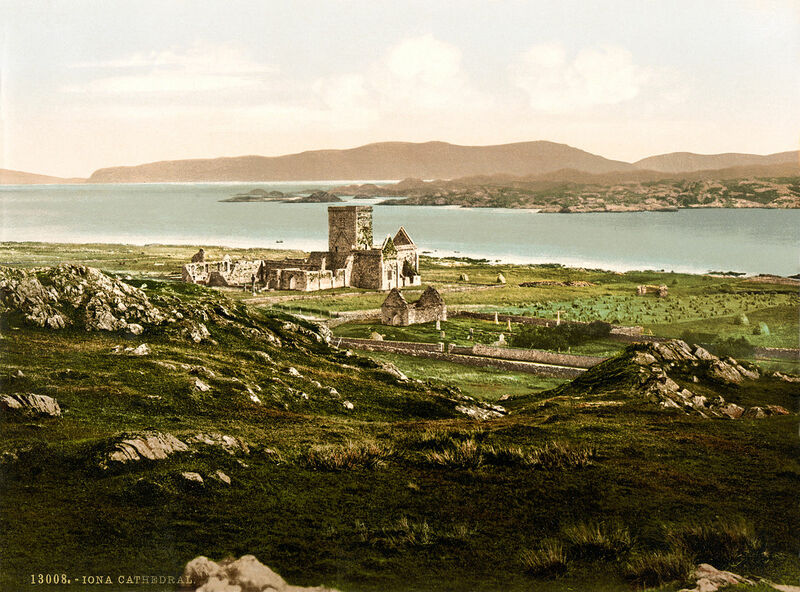 In 1899, the Duke of Argyll transferred ownership of the abbey and nunnery to the Iona Cathedral Trust, who extensively rebuilt the abbey church from 1902-1910. The majority of new building occurred on the western end of the church, since that was the side that had the most damaged. The church as seen today is a reconstruction of the Benedictine church, built on site primarily in the 12th and 13th centuries. Construction creates a lot of debris and leftover materials: rubble, chipped stone, gravel, mortar, shells used to make the mortar, etc. In the early 1900s, the much of the creation of these materials and discarding of the debris occurred directly south of the Abbey. The result of this, at least as pertains to our excavation, is that we have a large number of layers relating to this construction from 1902-1910: layers of yellow-green sandy mortar, of periwinkle and limpet shell, of chipped stone and large chunks of rubble, and pits full of big stones. 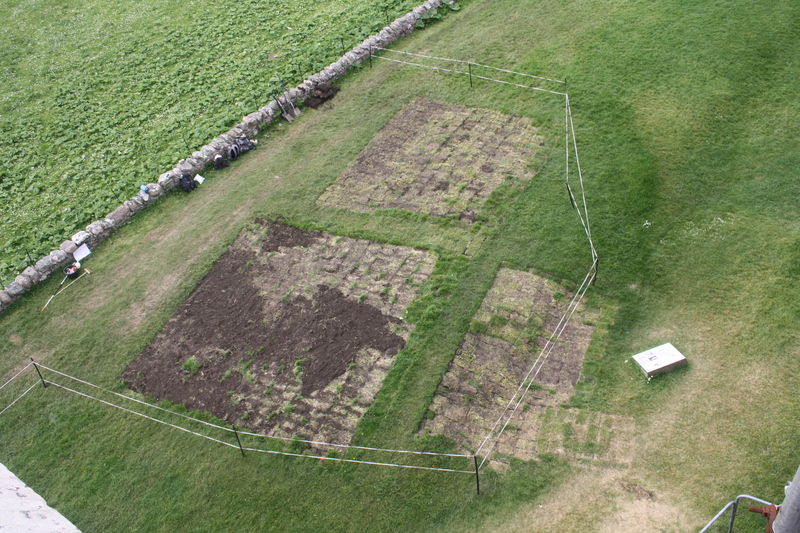 Rather than remove all of the debris when they had finished, the builders instead used it to level and landscape the western lawn of the abbey into the slight platform that it is today. The remains show the outline of the stonemason’s yard and the bench where they dressed the stones during this rebuilding phase. To have a chance of finding even the top of the early medieval stone structure we have been chasing, we must remove these layers of modern construction debris, which has given us a fairly clear picture of the building activities from the turn of the 20th century. We have met a large number of people over the last two weeks! If you happen to be in the area, we are excavating for another week. Feel free to stop by and say hello! Over the past few days, the primary activity on the trench has been drawing plans and taking photographs while investigating some of the modern layers we had not yet excavated. 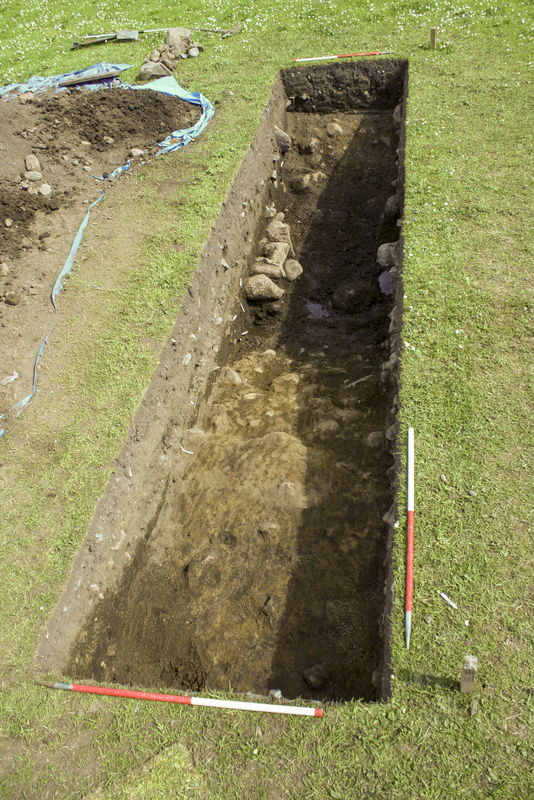 We expanded the trench to the west to determine whether we can find other portions of the structure, and have uncovered a large pit of stones from the conservation work in 1904 (more on that tomorrow). In the north extension, we have discovered a second, rectangular stone setting. We are unsure if this is connected in some way to the wall we have been investigating or if it is something else, but we are excited to see what we find! 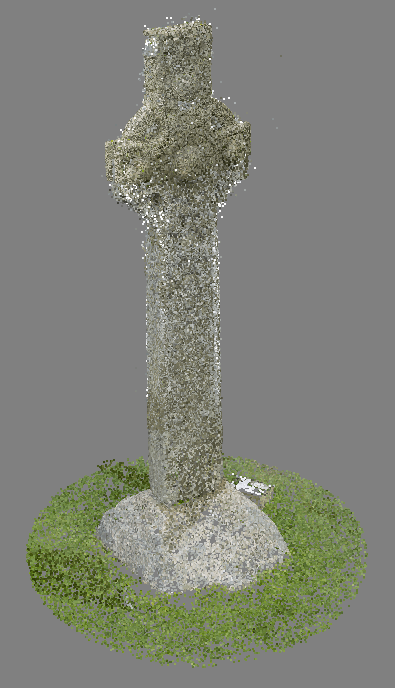 Some of the team have also spent the last three days making a photogrammetric 3D model of St. Martin’s Cross, the only high cross at the Abbey that has yet to be 3D modelled after efforts by the Discovery Programme in 2016 and the Concrete and Not-Concrete project at the University of Stirling in 2017. The cross stands just over 5m (16’8″) tall (including the base), which makes it a challenge to model safely. Our team required the use of a 5m (16’4″) pole, a large stepladder, and three individuals over two days to make it work. We think the results are definitely worth it, but will have to wait until we are back at the university to process the full model. Yesterday we had the absolute pleasure of hosting Christina Smith and Calum MacKinnon, both highly trained fiddle players in the West Highland tradition. Last year, Christina gave a marvellous performance in front of the high crosses in the museum. This year, we were delighted to have both Christina and her teacher return to the museum and play again in front of the high crosses.